The typical coworking manager is often a blur whizzing around the workspace. Or as a seemingly stationary robot typing manically on their MacBook Air. While to some it may seem like community managers are getting a ton of stuff done, in reality, community managers are often juggling an impossible load of minutiae at the expense of more impactful things. This is why freeing up time, by combatting inefficiencies and task inertia, is the number one hack for those who want to foster a vibrant coworking community. This article first appeared on Deskmag.com. And at the end of the day, or at the end of the week, you always ask that same perplexing question, “where the *bleep* did all my time go? !” Good question. Actually, that’s the question: Where is your time going? What a nebulous term inefficiency is. What does it even mean? I don’t think many coworking managers spend any time in Q4; they typically don’t have enough time to do any time-wasting activities. 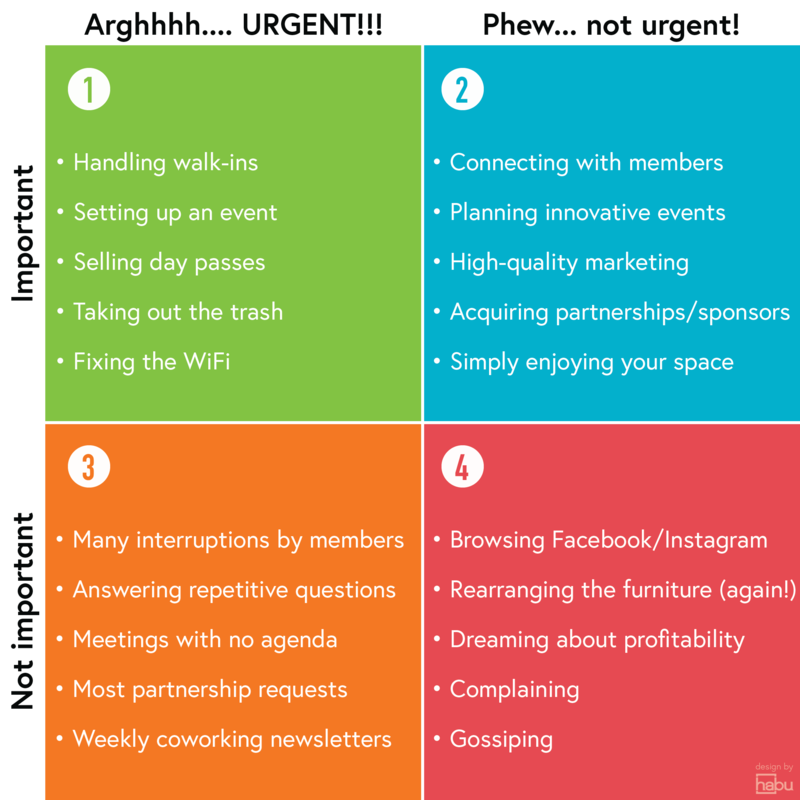 The issue to me is that coworking managers engage in a lot of Q1 and Q3 activities. And these quadrants are where there can be some massive efficiency gains. Actually, no. The reason is that Q1 tasks are also in the urgent category. Bear in mind that anything in the urgent category is by definition something that you likely could have prevented, planned better or prepared for. We can often solve for things in the Urgent category via automation and better processes. And this is how we’re going to claim a significant amount of our time back. The way to start is to, one-by-one, add powerful processes, technology, and methodologies to the various aspects of your work. The aim is to set yourself up for more streamlined future success. This is what's called Q2 work. Q2 work tends to get put on the back burner because it’s not urgent, but spending time there will reduce the amount work you end up doing in both Q1 and Q3 Not only will this will reduce the stress that comes with urgent tasks, but will also free up even more time for Q2 work, which is a virtuous cycle. Q2 work can consist of things like improving the space, planning fun events for your community, working on sponsorship or partnership deals, and connecting more closely with your members. What follows are a few categories that can be easily optimized via Q2 work, via such things as implementing processes, automation, software, and tools. Develop pre-planned agendas, meeting note templates, and a strict moderation practice. Every meeting should have a goal, and moderators should keep people on track ruthlessly. Keep meetings short. One useful and entertaining tactic is to use the water bottle strategy. At the beginning of the meeting everybody has to chug a bottle of water (or even better, a glass of water!). The first time somebody needs to go to the bathroom the meeting is over. Never have meetings to define a problem. Meetings are there for fast communication, to improve understanding through body language, and quick resolution of issues, not for waffling on about nebulous problems and ideas. Defining the problem in an email before the meeting always helps. Only invite relevant people to the meeting, and ensure the attendance of everybody pertinent to the subject of the meeting. Adding people in for ‘fun’ is a waste of that person’s time and adds unnecessary conversation. Leaving the wrong people out can cause the meeting to be repeated or could create the need for excessive post-meeting clarification and buy-in seeking. For example, I don’t go to our in-depth tech meetings, but I do go to product development meetings because I have valuable insights to contribute. Related to meetings above, stop sending emails back and forth to schedule meeting times. Using tools like Calendly and Doodle, you can make this process a snap. Calendly lets individuals and groups schedule specific time slots with you. This is useful for tours and people who have tighter schedules. Doodle lets groups crowdsource meeting times by offering a few time slots and allowing each person to vote. When a match is identified, the meeting can be scheduled. Batch emails. We’ll talk more about batching in the next section on task inertia, but here’s how it works. Ignore your emails until scheduled times during the day. Following Tim Ferriss’ recommendation, try 12:00 PM and 4:00 PM each day. Do not respond to incoming emails immediately. In fact, turn off your email notifications if you can. Gone are the days that coworking managers should be billing members manually. Billing for coworking spaces can now be entirely automated via coworking management platforms. The same goes for managing member meeting room bookings, signing members up to plans, and selling day passes. Even for small coworking spaces, the time savings usually far outweighs the cost of the software. Avoid custom deals at all costs. Custom deals, while they often bring in revenue you might need to pay the rent, can become a mental meltdown as the space grows. My good friend Tobias Kremkau of St. Oberholz told me, “When I first joined the team, everybody was on a custom deal. It took me a year to move everybody off of them, but moving people to standard plans was the only way we could grow.” Custom deals come back to haunt you. If you must use custom deals, use them sparingly and have a plan for getting people off of them. What about all that time you’re spending on tours? Host group tours one to three times per week and direct walk-ins to your scheduled tour hours. Yes, some people will be irritated, but then do you want such a fussy member in your community? Besides which, managing member expectations is also critical to reducing inefficiencies. An appreciation that your time is limited is part of that process too. While I always believe it’s best to meet prospective members in person, you could try and create a virtual tour or a video tour and post it on your website. Better yet, live stream the in-person tours once per week for those who can’t be bothered to come in! Try out a work-trade program utilizing your most personable members to let them conduct space tours for you. Give them a discount, free credits, or a complimentary membership in exchange for their time and focus. This is great for members who don’t work full-time or who are on a tight budget. Stop doing everything yourself. Outsource. The time you spend doing marketing poorly is money you could invest in hiring somebody that knows what they are doing and will do a great job in half the time. Automate. There are plenty of marketing automation tools available now. Try tools like Later, MeetEdgar, Buffer, and Likegrowers. New tools are released all the time so keep your ears to the interweb and listen for them. Create content templates into which you can feed new source material. One content model I like is the member interview/profile, wherein you interview a member for five to ten minutes, record it in whatever medium you prefer, and publish it on your blog. It’s easy, makes members happy, and promotes your space by letting prospects know who they’ll be working alongside. The act of reducing inefficiency is a near endless source for claiming back your lost time, and there are plenty of other areas other than those listed here where you can create efficient processes, utilize technology, and implement automation. Keep an eye out for those times when you feel frustrated by something tedious or repetitive. This is a sign that the task could use some Q2 work to make it more efficient and make you more effective. The rest of this article lives on Deskmag. Click through to read the rest!